The other day I had an entire bunch of bananas browning on my counter. My children like to request bananas from the store and then neglect to eat them so that I make banana bread instead of feeling bad about throwing out over ripe bananas. You would think I would learn from the past and quit buying bananas so often, but I guess I am a glutton for punishment. Ok, it really isn’t punishment though I still feel bad about the lack of consumption of the bananas. So now that I have digressed, I was facing an entire bunch of bananas which is way more than I could use with my Mom’s banana bread recipe and I really didn’t have the time to make two batches of bread that day. 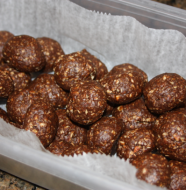 I turned to one of my favorite cookbooks in search of what to do with 6 bananas. 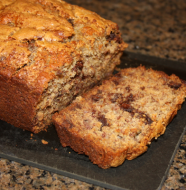 I found the recipe for this banana bread and decided to give it a try. I really enjoyed the bread and the banana flavor was quite intense. I am not sure how I felt about the banana slices that topped the bread but overall I felt like it was a good solid recipe. It almost reminded me of the way that Bananas Foster taste. My favorite part was the caramelization on top of the bread from a sprinkling of sugar…so tasty! While I will not be giving up making my Mom’s recipe, this one will be used in the rotation, especially when I have more than three bananas that are in desperate need of being used. Preheat oven to 350 degrees, making sure the oven rack is in the middle position. Spray an 8X4 loaf pan with non-stick cooking spray, set aside. Place 5 bananas in a separate bowl, cover, and microwave until bananas are soft and have released liquid, about 5 minutes. Transfer bananas to a fine-mesh stainer over medium bowl and allow to drain stirring occasionally, for 15 minutes (you should have 1/2 – 3/4 cup of liquid). Transfer liquid to a medium saucepan and cook over medium-high heat until reduced to 1/4 cup, about 5 minutes. Remove pan from heat, and stir liquid into bananas, and mash with a potato masher or wooden spoon until mostly smooth. Whisk in butter, eggs, brown sugar, and vanilla. Pour banana mixture into the dry ingredients and stir until just combined, with some streaks of flour remaining. Gently fold in walnuts, if using. Scrape batter into prepared pan. Slice remaining banana diagonally into 1/4-inch thick slices. 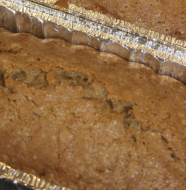 Place the banana slices on top of the loaf in 2 rows making a shingle type pattern, leaving the center empty. Sprinkle granulated sugar evenly over loaf. Bake until toothpick inserted in center of loaf comes out clean, 55-75 minutes. 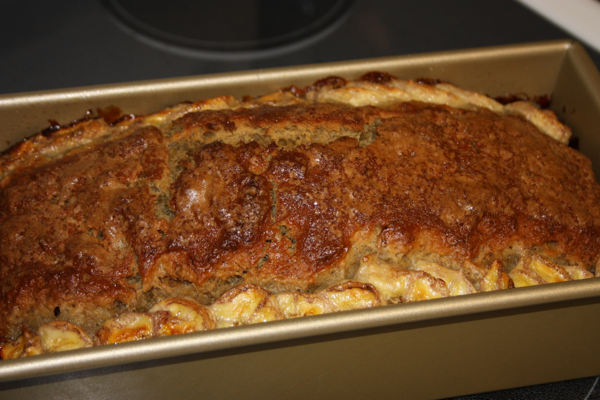 Let loaf cool in pan for 10 minutes, then turn out onto a wire rack to cool for an additional hour before serving. 2 Comments on "Ultimate Banana Bread"
Don’t forget. 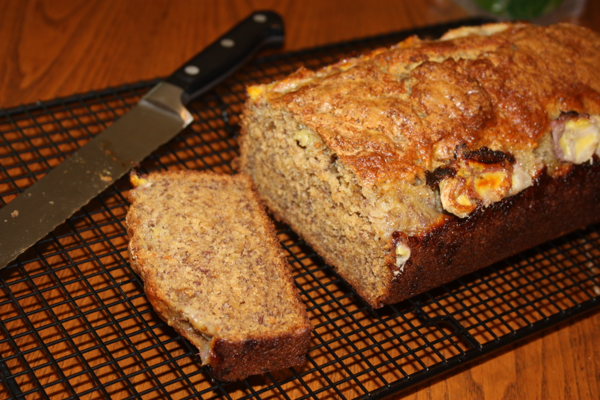 Bananas can be peeled and frozen for banana bread later. You can also use them in other recipes like pancakes. Thanks for reminding everyone Melinda. Unfortunately we have quite the stock of bananas in our freezer as well. Not necessarily a bad thing.